"An upper chamber in a darkened house"
"His heart was in his garden..."
"Sometimes I walk where the deep water dips"
"Thin little leaves of wood fern, ribbed and toothed"
Frederick Goddard Tuckerman was a 19th century American poet and, at least for a short time, he worked as a lawyer. He became more famous during the next century rather than when he was alive. He is best known for his considerable output of sonnets although he did write in other forms besides that. His work has often been included in anthologies of notable American poets. He was born on the 4th February 1821 into a Boston, Massachusetts family living in prosperous circumstances. He studied at Harvard University but did not complete his time there due to a medical problem concerning his eyesight. Despite this he was able to go to law school, graduating in 1842 and being admitted to the bar. This career did not please him though and he was quoted as saying that law practice was “distasteful”. His family circumstances meant that there was no need for him to actually earn a living so he then decided to concentrate on much more agreeable past times such as literature, astronomy and botany. He seemed to withdraw from society after a move in 1847 to Greenfield, western Massachusetts. Solitude suited him and allowed him the time to write and study nature but this did not prevent him from occasional foreign trips. In England he struck up a life-long friendship with Alfred, Lord Tennyson and he became one of many established writers who Tuckerman was drawn to. Others would include such luminaries as Henry Wadsworth Longfellow, Nathaniel Hawthorne and Emily Dickinson. He was, perhaps, encouraged by others to publish his only collection of poetry in 1860. The book, titled Poems, was favourably received by both readers and other writers but was not commercially successful. He was certainly not tempted to make other attempts to have work published. He felt that he had “exposed himself to the world” quite enough, and was happy to return to his happy life of peace and seclusion. He was not, however, alone at Greenfield as he had married soon after arriving there. His wife Hannah bore him three children but she tragically died giving birth to the last child only ten years into their marriage. Her death had a deep and significant effect on Tuckerman and caused him to withdraw even more. Some said that he wrote in the Romantic tradition that was still prevalent in the mid-19th century. Although he favoured a life of quiet obscurity his work drew much appreciation, mostly after his death. 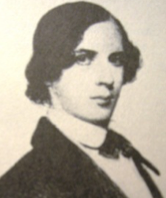 Frederick Goddard Tuckerman died in his beloved Greenfield home on the 9th May 1873. He was 52 years old.